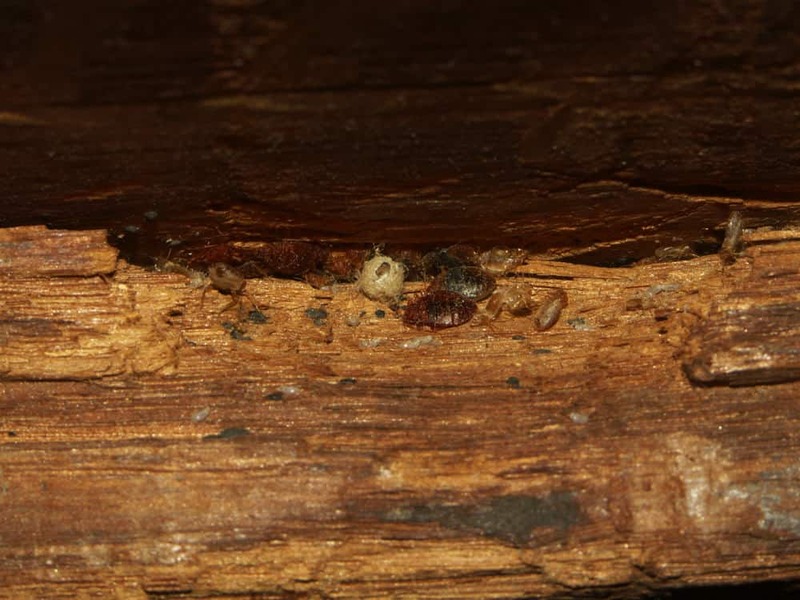 Have you ever wondered whether bed bugs can live in wood in your home? If you’re like many homeowners and renters, you’ve probably heard about the recent rise in bed bug infestations, and are quite reasonably worried about these pests getting into your place. Maybe you’ve even wondered if there’s something you can do to keep them out before they become a problem. The truth is, people are becoming so desperate to stop bed bugs that they’ve gone to some pretty drastic measures that aren’t even effective at treating these pests. Because of that, I want to make sure that you have the right information about bed bugs, their behaviors, and how to stop them in your home. Fortunately, through my research, I’ve discovered the answers about whether bed bugs live in wood. Unfortunately, the answer is that yes they can. Don’t worry, though. If you have bed bugs living in wooden furniture or floors in your home, you can take care of the problem by following the advice in this article. Do Bed Bugs Have A Preference Towards Wood? What Would Make A Bed Bug Live In Wood? Everyone’s looking for a reason to have the peace of mind that bed bugs are not going to invade THEIR home. First, it was the idea that if you keep a clean home, you won’t get bed bugs because they are a sign of a dirty or cluttered home. Of course, we know that’s not the case. No matter how clean your home is, anyone can get bed bugs. Bed bugs do not live in or eat dirt, nor do they eat food waste or crumbs. All they need to feel at home in your place is a human host they can get a blood meal from. Additionally, bed bugs do not really care whether their host is a clean or dirty person. As far as current research can tell, they are drawn to the carbon dioxide you exhale, not the smell of your body. Now people are wondering if keeping a certain type of furniture or certain surfaces, like wood, make them more or less susceptible to a bed bug invasion. The answer is no. There are some surfaces that are more difficult for bed bugs to climb, but that isn’t going to stop them from finding somewhere in your home where they can reach you. Put simply, bed bugs will hide in wood, and they will also hide anywhere else with tight, dark hiding spots. 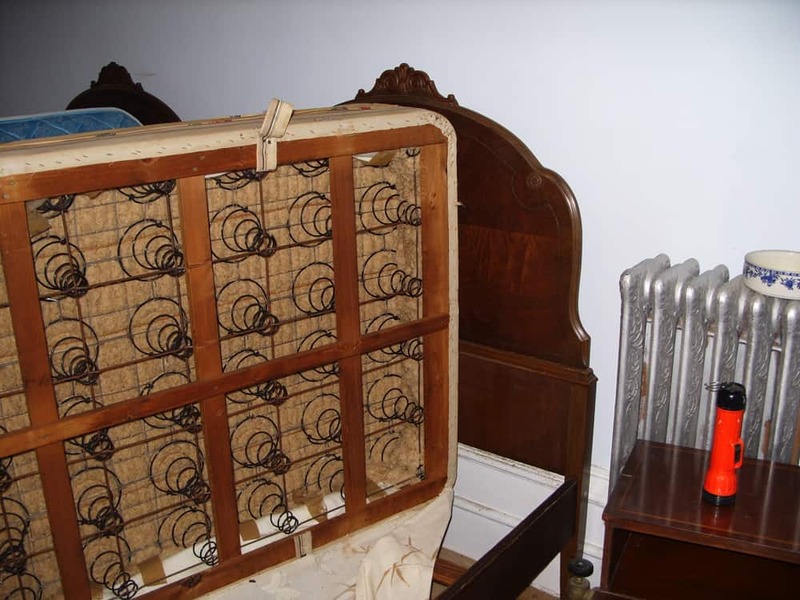 It’s been suggested in some forums that switching from wooden to metal bed frames may reduce or eliminate bed bugs. 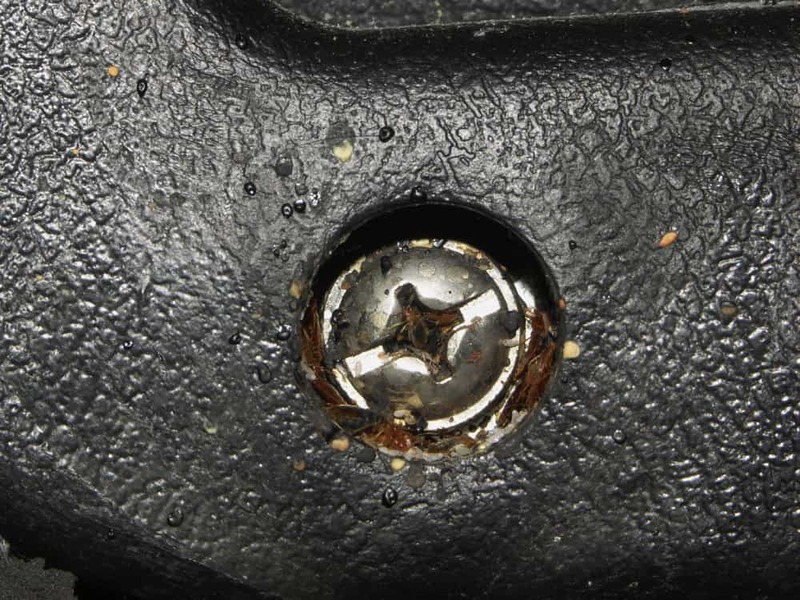 Although smooth surfaces are difficult for bed bugs to walk on, most metal only appears smooth. It has fine grooves that allow bed bugs to gain purchase and climb, and even if they couldn’t climb the metal, they find other ways into beds and furniture. Bed bugs can climb both wooden and metal bed frames, so don’t switch out your wooden furniture for metal unless you’re doing it for aesthetic reasons. 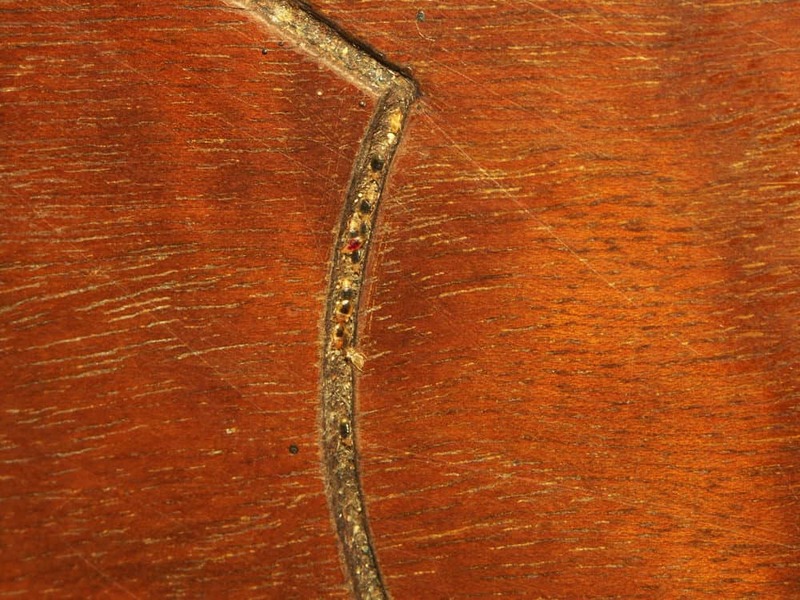 Bed bugs may be harder to spot on wood furniture, depending on the color. That’s because bed bugs themselves tend to be brown or reddish in hue. On lighter colored woods, though, you’ll likely be able to see their waste quite easily. Here’s another reason why switching the type of bed frame you have is not useful in deterring bed bugs. These pests can climb your walls and ceilings. Many people have reported seeing bed bugs on the ceiling that fall off and land on the bed. What would make a bed bug live in wood? All it takes is an available human host! Your blood is what the bed bugs are after, so if you’re in a room with wood, that’s where they’ll hang out. It’s not the wood; it’s you. More specifically, it’s the carbon dioxide you exhale, since that is the signal bed bugs use to hunt down hosts. Let me clarify one thing though. 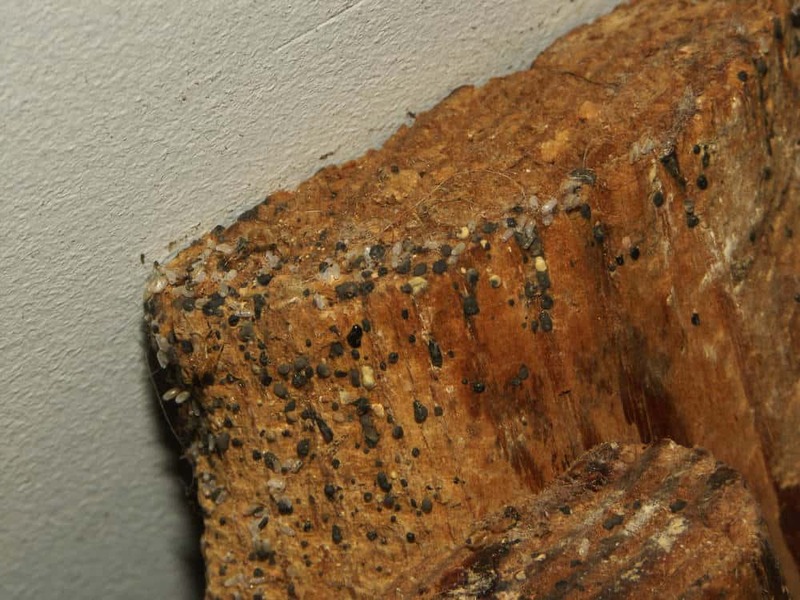 Bed bugs do NOT burrow into wood. They do not live inside the wood itself. That is impossible for them. Their mouthparts are highly specialized to pierce human skin, and only the top layers of that. Neither their mouths nor their legs are equipped to dig or bite their way into wood, like some other insects can. 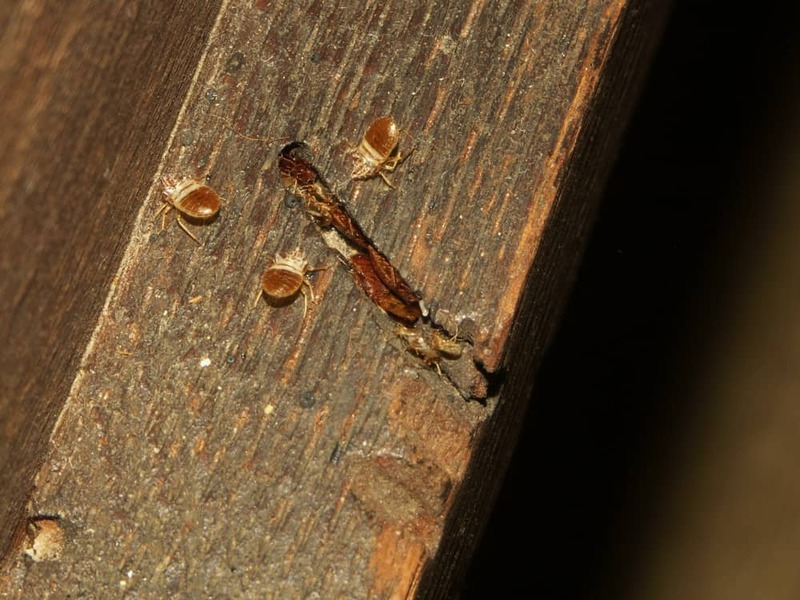 So when bed bugs are found in wood furniture, they are just living in the existing cracks, crevices, and dark hidey holes that the wood affords them. The larger the amount of dark and hidden cracks and crevices in the wood, the higher the chance a colony of bed bugs will make it their home. Not only are they a perfect place to hide due to most woods matching their rusty colors, but they're also a great area for them to lay eggs out of reach. One of the biggest things you can do to prevent bed bugs from living in the wood furniture in your house is to inspect all new furniture before you bring it into your home. You see a lot of advice on the internet to inspect secondhand furniture, but I would go even further to say inspect EVERY piece of furniture you intend to bring into your home. Yes, secondhand furniture could be coming from a home that had bed bugs, but the thing some people forget is that bed bugs can be in any building, not just houses and apartments. They have been found in hotels, movie theaters, schools, and even in vehicles. 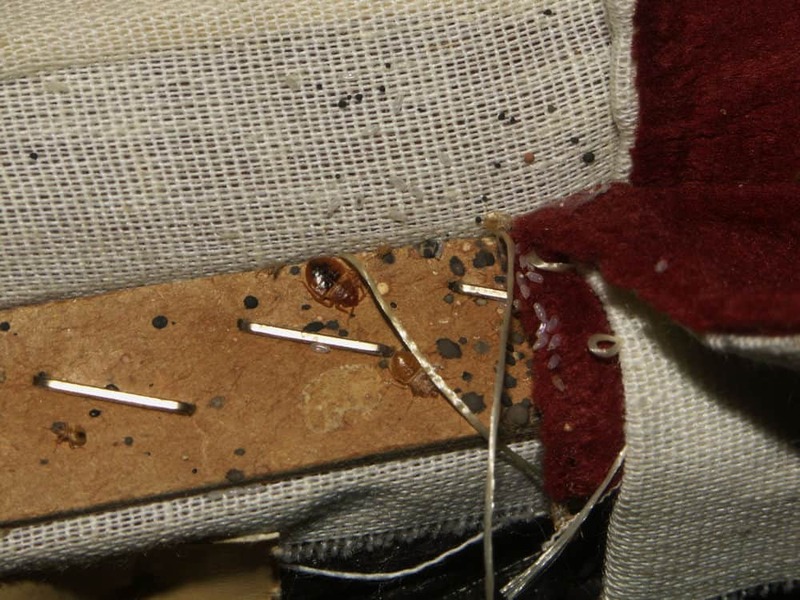 It is completely possible that your new furniture could come from a place that has a bed bug problem. 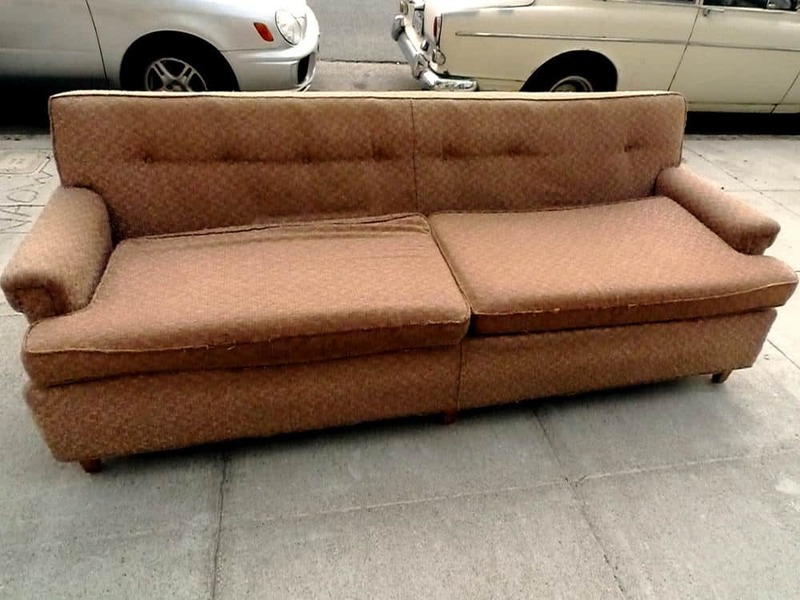 Be careful with secondhand furniture - especially if it's been dumped on the street. It may have been thrown out due to harboring an infestation. If you’re really concerned about bed bugs, or have had them before, you may want to consider selecting furniture that allows you to see them better, but there is not furniture that will prevent them. Any furniture with cracks or etched detailing provides additional places for bed bugs to hide. Remember, they’re only about the size of a lentil or grain of rice. There is another step you can take to prevent and stop the spread of bed bugs. Not many people are talking about using caulk to prevent bed bugs, but it is actually quite effective at treating a wide range of pests. Caulk has been used to deter ants and other insects from getting into homes, and it will work the same way for bed bugs. What way is that exactly? Caulk simply fills up the available hiding spots. Again, bed bugs love to get into tight, dark places where they can hide. If you fill them all up with caulk, it reduces the space available for bed bugs to establish a colony. Now, even experts who use this method will tell you that sealing with caulk alone will not take care of the whole problem. Bed bugs are tricky and will find places you can’t reach. One method that is proving extremely effective though, is to treat the area where you find a colony, and then seal after treating. You seal in the treatment and the bed bugs. They then cannot escape your treatment and cannot use their previous exit for a meal. The key to effectively treating bed bugs is to attack the precise location where they are. This is why many foggers and bug bombs end up being ineffective, because they don’t reach the cracks and crevices where bed bugs hide. Whatever treatment method you are using, be sure to treat all the furniture in the room. Bed bugs could be hiding anywhere. Check your wood furniture, and even take it apart. Then, apply your preferred treatment inside all the cracks and crevices of the wood. This goes for metal furniture too. There may be less hiding spots in metal furniture, but any legs or frames with hollow metal tubes are potential bed bug hideouts. A few of the bed bug elimination methods that may work for treating wood furniture and floors are targeted heat treatments using a heat gun or steam cleaner, specialized bed bug treatment sprays, or essential oils applied directly in the hiding areas. You should take care not to damage your furniture or floors if you’re heat treating the wood. 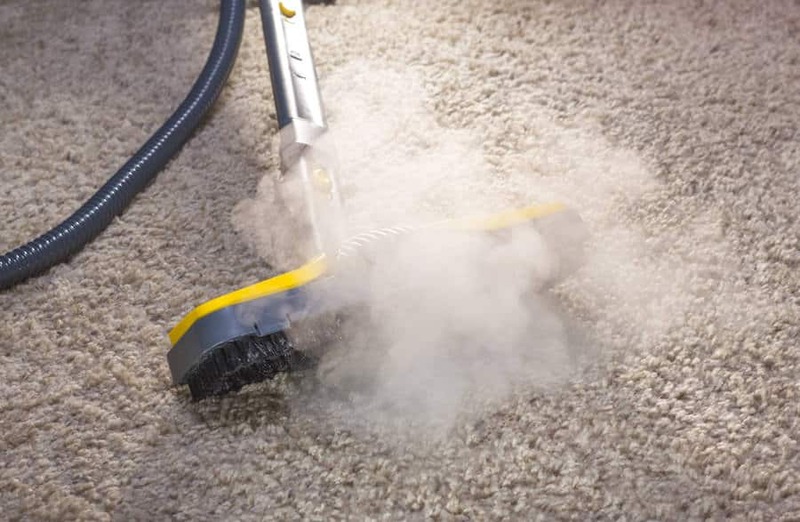 A steam cleaner is also a good way to treat wooden baseboards, which are a favorite hiding spot for these pests. Search around very carefully. While it's harder to find bed bugs during the day, if you know where to look, it shouldn't take too long until you see where they're hiding up. What’s the bottom line? Don’t try to remove all the wood furniture from your house. Getting rid of wood is not going to get rid of bed bugs. They will live in wood, but only because it is available, not because they prefer it over other materials. The answer to whether bed bugs can live in wood is yes they can, but they will live anywhere that human hosts are present.